Note: For those living in San Francisco this New Moon takes place above the eastern horizon about 40 minutes after sunrise. The Sun, New Moon and planets are located in the same constellations for other parts of the world; these constellations, in differing time zones, lie in a different location above or below the horizon. The Easter Festival, the first of the three major spiritual planetary festivals, is celebrated at the Full Moon during Aries. This Full Moon, the first after the March Equinox, helps determine the date of the traditional Easter Sunday. This is the Festival of the Risen One, the Living Christ, and honors the time of resurrection and the birth of divine ideas. The Festival's lunar cycle begins with this New Moon. Review the New Moon map above. The New Moon and Sun conjoin the planet Jupiter and the star Alpheratz of Andromeda. The planets Uranus and Mars are in exact conjunction the day of the New Moon at 1:52pm PDT (21:52 UT). Mercury is retrograde 3/30-4/22. This is an incredibly significant and extremely potent lunar cycle. The New Moon of April 3, 2011 occurs in sidereal Pisces amongst a stellium of planets, including Mars, Uranus, Jupiter, Eris[*] and Mercury ... The New Moon aspects the two largest and most influential planets in our solar system ... [it] conjoins mobilizing and expansive Jupiter and it lies opposite imposing Saturn ... Saturn, in sidereal Virgo and conjoining the stars of Corvus, the Raven Messenger, demands we heed and respond to the signs expressing through the natural world around us. ... The New Moon conjoins Alpheratz, the head of Princess Andromeda, and Alderamin, the Alpha star of King Cepheus. Making passage through the tumultuous waters of life, and the means to do so, is of issue. Mars and Uranus also make their conjunction on the New Moon, and they conjoin the Vernal Point of Earth's Precessional Cross[*]--again activating our portal of evolutionary transition. Expect the unexpected with stimulus to take creative, spontaneous and radical action, an energetic that will intensify over the months ahead. Earth and retrograde Mercury begin a new 116-day synodic cycle[*], stimulating a shift in the logistical aspects of our lives. This new synod conjoins massive and highly active Eta Carina of Argo Navis, a portent of evolutionary change. Note: Saturn is now at a near Earth approach, with an exact opposition to the Sun the day of the New Moon, 11:00pm PDT (06:00 UT 4/4). The planet's next close contact occurs in 13 months. The Lord of the Rings is out all night long and shining brighter than it has since 2008. It has been noted when Saturn and Jupiter are on opposites sides of the Sun, our Sun becomes active. This is occurring now. (BTW: Jupiter and Saturn were in exact opposition 3/28. Jupiter and the Sun are in exact conjunction 4/6.) The Sun in its active cycle increases the likelihood of power grid overloads/outages and satellite disruption [*]. Solar maximum may even increase earthquake/volcanic activity and emotional upsets, however this concept is not well understood nor agreed upon. Click this image to see the solar system's syzygy (siz-i-jee), planetary line-up, at the time of the New Moon. One can only wonder how the tugs and pulls of this gravitational system affect the Sun, Earth and humanity. A significant astronomical-earthgrid resonance occurs on the New Moon of April 3, 2011 at the exact location of the March 11, 2011 Magnitude 9.0 Earthquake and Tsunami. Whether this resonance will trigger additional or significant seismic activity is of course unknown, however taking precautionary measures certainly would be wise. We are in the transition of the ages and spirit and form are in the process of becoming one cooperative unit. This realignment, experienced personally and worldwide, is creating much turmoil for humanity. 'Tis the season for hanging on the cross of matter. We rise to the occasion by embracing the unknown, by breathing in God and breathing out fear. Maureen Moss guides one through the re-birthing breath and gives an invocation to release fear in this article. Full Moon during Aries, begins with this New Moon. April 4-7, Monday-Thursday, Look for slim Crescent Luna in the west about an hour after sunset. DuskYoung Moon Map Invoke the Light of God as the Crescent Moon approaches the Pleiades star cluster and Aldebaran our star of enlightenment. "Let Light descend on Earth." Saturn is at its best, rising in the east around sunset, high in the south at midnight, setting in the west around midnight. Learn more about the young Moon and Saturn from this fun and informative 5-Minute Star Gazer Video. Be sure to look for the large triangle formed by yellowish Saturn, bluish Spica and golden Arcturus. Binoculars bring out their colors. Saturn 10pm Early April Map Saturn also lies within a triangle of bright stars; use this midnight map for orientation and constellation recognition. A Colorful Moon ~ Happy Easter! This false-color image of the Moon was constructed from data acquired by Galileo in December of 1992. The colors are produced by displaying three color ratios in red, green, and blue. The distinctive bright spots are fresh craters such as Tycho (bottom center), which may be bright blue, green, or orange, depending on the mineralogy. Many of the craters are surrounded by reddish rings, probably due to thin veneers of glassy impact melt. The youngest large craters are surrounded by bright blue ejecta and rays. 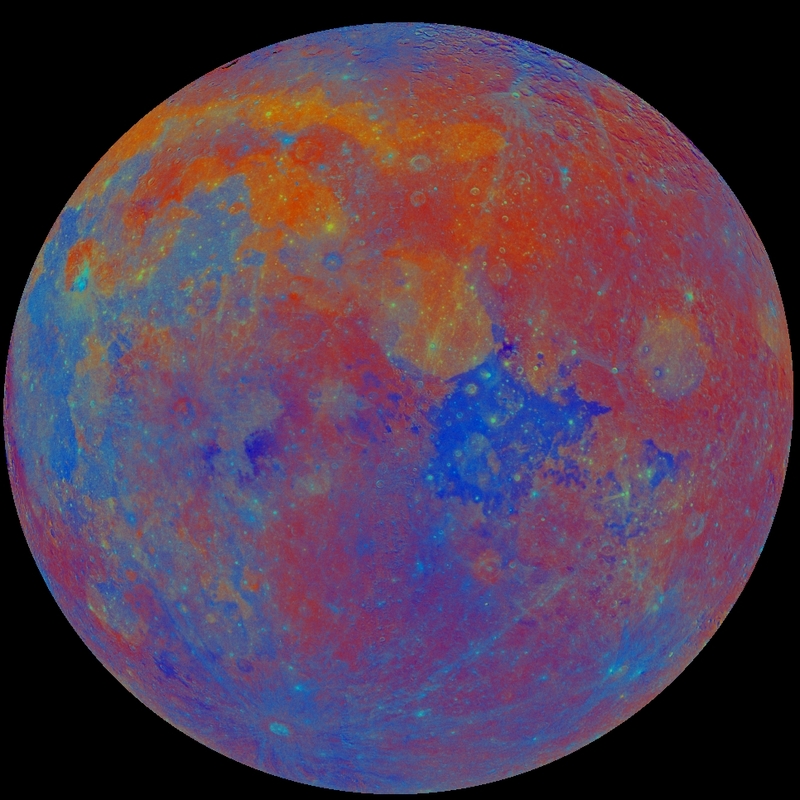 The large orange areas (upper left) consist of iron-rich mare lavas, whereas extensive deep-blue areas consist of titanium-rich mare lavas. The darkest blue (or purplish) spots (center) consist of "dark-mantle" deposits, from explosive volcanic eruptions, which are rich in titanium and relatively rich (for the Moon) in volatiles. There is considerable interest in exploiting the dark mantle deposits to extract oxygen, helium, and other elements. The extensive reddish areas consist of highland materials, rich in the mineral plagioclase. What was conceived at the New Moon, Rising to the Occasion ~ Breathe In God ~ Breathe Out Fear, review above now comes to fruition and is birthed into the full light of our conscious minds. Easter's Full Moon is exact April 17 at 7:44pm PDT (02:44 UT 4/18). It marks the first of the Three Major Spiritual Festivals, The Easter or Aries Festival, celebrating the Risen One. In 2011 Passover occurs April 19, Good Friday April 22 and Easter Sunday April 24. Note: The first Full Moon after the March equinox helps determine the date of Easter, which is observed each year on a Sunday. The Heavenly Holy Grail reveals the significance of the Easter Full Moon and its position in Virgo the Virgin's Holy Grail. It describes the celestial Virgin's relationship to the Big Dipper, Arcturus and Spica, and how Easter's Full Moon relates to the Sun in the constellation of the World Savior. In 2011 Saturn resides in Easter's Holy Grail west of the Full Moon. Five planets and our Sun line up opposite Virgo's celestial chalice in the constellation of Pices, the World Savior, dramatically affecting humanity. Click the Heavenly Holy Grail link to see maps and learn more. Ted says, "Ah, the power and prophecy of the Divine is not limited to one book or another, it is before us in the vault of heaven."